California has Silicon Valley. Could a Silicon Forest in Washington be next? A team of materials scientists from Pacific Northwest National Laboratory is on it. Yongsoon Shin and colleagues at the Department of Energy lab have converted wood to mineral, achieving in days what it takes nature millions of years to do in such places as the Gingko Petrified Forest, an hour up the Columbia River. There, trees likely felled in a cataclysmic eruption and, buried without oxygen beneath lava, leached out their woody compounds and sponged up the soil's minerals over the eons. Petrified wood is a type of fossil, in which the tissues of a dead plant are replaced with minerals (most often a silicate, like quartz). The petrifaction process occurs underground, when wood or woody materials suddenly become buried under sediment. Mineral-rich water flowing through the sediment deposits minerals in the plant's cells and as the plant's lignin and cellulose decays away, a stone cast is left in its place. Shin's petrified wood journey began in a less dramatic fashion, a few minutes away at Lowe's, Shin's group reports in the current issue of the journal Advanced Materials, in the do-it-yourselfer chain's lumberyard,. There they picked up their raw material: pine and poplar boards. Back at PNNL, they gave a 1 centimeter cube of wood a two-day acid bath, soaked it in a silica solution for two more (for best results, repeat this step up to three times), air-dried it, popped it into an argon-filled furnace gradually cranked up to 1,400 degrees centigrade to cook for two hours, then let cool in argon to room temperature. Presto. Instant petrified wood, the silica taking up permanent residence with the carbon left in the cellulose to form a new silicon carbide, or SiC, ceramic. The material "replicates exactly the wood architecture," according to Shin. Although SiC chips are unlikely to replace computer chips, materials scientists are interested in the novel properties of ceramics built on templates of wood and, in Shin's lab, other natural materials such as pollen and rice hulls. 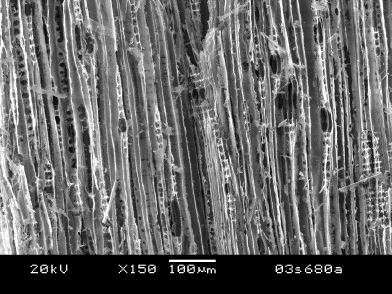 The intricate network of microchannels and pores in plant matter provide enormous surfaces--in wood, 1 gram of material flattened out would cover a football field--that may prove useful in industrial chemical separations or filtering pollutants from gaseous effluents. The acid-leaching method yields an identical, positive reproduction of the wood. If Shin wants to capture a negative impression, he can alter the pH to favor the base end of the scale. "The positive replica is a lot better in terms of surface area and uniformity," Shin said. "Negative forms collapse easily, but it is possible to make fiber-type materials," where the minerals fill in wood-grain openings.